Figure 1. TREM2 protein is expressed in THP-1 cells but absent in Jurkat cells. 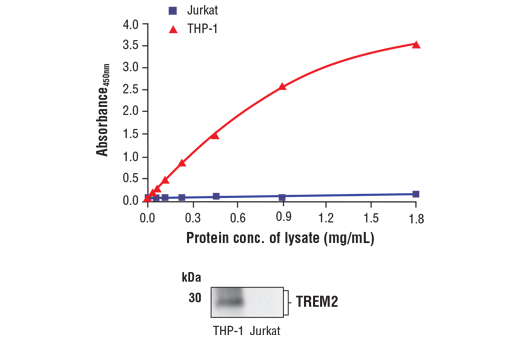 The relationship between lysate protein concentration from THP-1 and Jurkat cells and the absorbance at 450 nm using the FastScan™ Total TREM2 ELISA Kit #23831 is shown in the upper figure. The corresponding western blot using a TREM2 antibody is shown in the lower figure. Unstarved THP-1 or Jurkat cells were harvested and then lysed. The FastScan™ Total TREM2 ELISA Kit is a sandwich enzyme-linked immunosorbent assay (ELISA) that detects endogenous levels of TREM2. To perform the assay, sample is incubated with a capture antibody conjugated with a proprietary tag and a second detection antibody linked to HRP, forming a sandwich with TREM2 in solution. This entire complex is immobilized to the plate via an anti-tag antibody. The wells are then washed to remove unbound material. TMB is then added. The magnitude of observed signal is proportional to the quantity of TREM2. Antibodies in kit are custom formulations specific to kit. The FastScan™ Total TREM2 ELISA Kit detects endogenous levels of TREM2 as shown in Figure 1. This kit detects proteins from the indicated species, as determined through in-house testing, but may also detect homologous proteins from other species. The triggering receptor expressed on myeloid cells 2 (TREM2) protein is an innate immune receptor that is expressed on the cell surface of microglia, macrophages, osteoclasts, and immature dendritic cells (1). The TREM2 receptor is a single-pass type I membrane glycoprotein that consists of an extracellular immunoglobulin-like domain, a transmembrane domain, and a cytoplasmic tail. TREM2 interacts with the tyrosine kinase-binding protein DAP12 to form a receptor-signaling complex (2). The TREM2 protein plays a role in innate immunity and a rare functional variant (R47H) of TREM2 is associated with the late-onset risk of Alzheimer’s disease (1,3). Research studies using mouse models of Alzheimer’s disease indicate that deficiency and haploinsufficiency of TREM2 can lead to increased β-amyloid (Aβ) accumulation as a result of dysfunctional microglia response (4). These results agree with the distribution of TREM2 in human brain regions (e.g., white matter, the hippocampus, and neocortex) that are involved in Alzheimer's disease pathology (2). In addition, amyloid plaque formation induces expression of TREM2 and amyloid phagocytosis (5). Loss-of-function mutations in the corresponding TREM2 or DAP12 genes can result in Nasu-Hakola disease, a rare form of progressive presenile dementia that results from polycystic osseous lesions (6). TREM2 membrane shedding occurs by cleavage at the extracellular site between H157/S158 generating an N-terminal shedded fragment and a membrane bound C-terminal fragment (7, 8). Colonna, M. (2003) Nat Rev Immunol 3, 445-53. Jonsson, T. et al. (2013) N Engl J Med 368, 107-16. Boutajangout, A. and Wisniewski, T. (2013) Int J Cell Biol 2013, 576383. Wang, Y. et al. (2015) Cell 160, 1061-71. Melchior, B. et al. (2010) ASN Neuro 2, e00037. Klünemann, H.H. et al. (2005) Neurology 64, 1502-7. Thornton, P. et al. (2017) EMBO Mol Med 9, 1366-1378. Schlepckow, K. et al. (2017) EMBO Mol Med 9, 1356-1365.